How much of this science vocabulary do you know? Find out with these category and matching games. Instructions: match the meanings on the left with the science vocabulary on the right. Several words are related-- a verb and noun from the same family. So choose the verb if the definition starts with "to ___." Choose a noun if it asks for a thing (a or an _____.) The first one is done as an example. When you have finished matching, click "check" to see how many you knew. A monitor is a machine that measures or 'watches' what's happening. A baby monitor carries the sounds the baby makes to his/her parents in another room. A computer monitor is the part of a desktop computer that you look at-- the screen and frame. Formula sometimes means a pattern of words always used together. 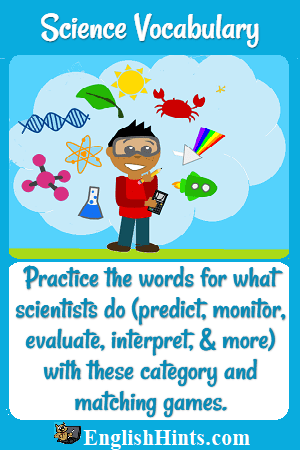 See Science Words Sentence Fill-ins for sentences to practice the science vocabulary above. (It was originally part of this page, but it made the page too long.) In addition, some of the original matching practice was moved to Scientific Method Vocabulary in order to make the exercises interactive. It also has an essay on the scientific method. Words for Health, illness, and Types of Germs has more science vocabulary and practice. You can also take a Science Words Quiz (a pdf-- right-click to download) or a longer, interactive Research and Scientific Words Quiz. Home> Vocabulary Games> Science Vocabulary.